Happy Monday Everybody!! And it's just about to get even happier!! A few weeks ago, the good people at Silhouette shipped me one of their fancy little machines to see if I liked it...well, after I saw everything this little beauty could do, I was so excited I just had to try it for myself. And I LOVE it!! "What does it do?" you ask. This little machine will help you create all kinds of fabulous things! 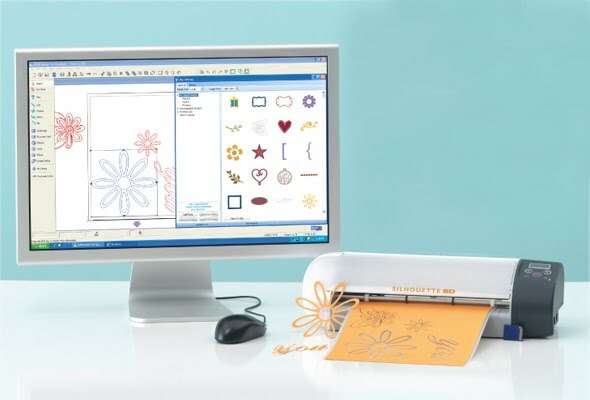 The Silhouette is essentially a digital cutter...but get this, rather than using cartridges, this little machine hooks up to your computer!! Because of this innovative approach, it allows you to create all sorts of shapes and letters...basically anything your heart desires...and it will cut them out for you. It comes with a library of shapes at no charge. AND (and this is one of my favorite things) it can cut out words in ANY FONT that you have on your computer! What if you don't see the shape you need? No worries!! You can create your own with the drawing tools in the program OR you can go online to the Silhouette shop and purchase a design from their shop! They have what seems like thousands of options and you can purchase them each individually (no buying what you don't need or want). But the more you purchase, the more money you save! And you can also purchase fonts...and get this...the fonts will not only be available for your Silhouette to use...you can also use them in any program on your computer that uses fonts. Ohhhh yeah. You can create cut outs for scrapbooking. You can create cards or other paper goods. You can create fabric transfers. And of course, you can create vinyl lettering. Do you remember a few weeks back when I was swooning over vinyl lettering on mirrors? (Can you see it coming?) Well...I used my Silhouette to create a vinyl-lettered-mirror of my own!! And followed the easy-to-follow instructions to adhere it to my mirror. There are many more projects I've been working on, and I'm so excited about them, that I'll share more throughout the week! How you can win.1. Leave a comment! 2. Go over to Silhouette’s site and check things out. Then, come back and leave a comment to tell me how you’d use the Silhouette if you had one. 3. Blog about it with a link back to this post, then come back and leave a second comment with the link. 4. Mention it on Twitter or Facebook (with a link to this post) and leave another comment letting me know...make sure to leave an additional comment for each thing that you do. Must be a resident of the USA to win. Silhouette cannot ship outside of the USA. I SO want to win one of these... the things I would create with this! wow,what a giveaway!!! I would love to be able to make vinyl clings . I'd love to make some vinyl for my kitchen & do some glass etching too! I would make lots and lots of vinyl to decorate my GA room at Church, and fun holiday signs & things. I would probably become a vinyl junkie and you'd see me on one of these intervention shows....LOVE this giveaway! This would be amazing! Let's be real, I got a Cricut and I'm kinda disappointed with it. This looks so much better! I would love to cut out t-shirt vinyl and make my son some cute shirts! I love the idea of being able to add wording to a mirror, as you showed in your post. I think I'd also love to put inspiring quotes on the wall of my studio. *LAUGHS* Oh the typos in my comment! Told ya I have no feeling in my hands! I would love to win a Silhouette! I would do vinyl wall words, heat transfers on clothing,oh the possibilities! I immediately have so many ideas of how to use this machine! I had no idea that these things existed! I'd be thrilled to win! I would certainly use this machine to help me decorate my second grade classroom - I'd have the most stylish bulletin boards in the whole school! I also love the glass etching shown on the website. I'd love to try that as a way to personalize wedding gifts! I've got my fingers crossed I want this little gizmo!!! The Silhouette is at the top of my wish list right now! I'd love to create original clothing for my son with it. Such a great giveaway! I really want to win this! I would use it for scrapbooking and vinyl decals. I'd love to use it for card making. What a great give away. Hope I win. I enjoy your blog. I would use the Silhouette to create cute vinyls to decorate my home. Fabulous giveaway!!! Who wouldn't want to win this. I think if I had one, I would go crazy making gifts for all my friends...ooooohh the things I could do! It would be a dream come true to win this! I would make wall art, some really cool decorations for my daughters graduation and lots more! Now this looks like a very cool tool. I am leaving on a BIG exciting vacation for the next month and will be scrapbooking all of it at two weekend crops shortly after I get home...this maching would be amazing to add fnts and accents to my pages. OH how I wold love to win this! It would be such a blessing! Thank you for hosting such an awesome giveaway. I have been pining for one of these for quite awhile now! I went to their site...what wouldnt I use this for?!?! My first project would be cutting a template for fabric painting. So awesome! Love your mirror with the quotes! I really want to make subway art family rules. I also would use it in my classroom to personalize things for my students in fun ways. Wow, what an amazing new toy! I would like to get in on the vinyl craze! oooh this looks so easy to store & sounds great to create with & use. I would use this for weddings, graduation, teacher's gifts, crafting & baking. I've been wanting one of these machines SO bad, so I would definitely be on "cloud nine" if I were to win! My first projects would be some vinyl wall art for my son's room. Oh I have been WANTING one of these so badly...it's just not in the budget! A win would be a.m.a.z.i.n.g!!! This is an incredible give away...I never go for these things, but I would LOVE one of these!!! i would love one of those! imagine all the fun projects to do! i would use it to catch up on my boys' scrapbooks, finally! Hands down, I'd like to be able to make vinyl lettering & images!!!!! Their site is amazing! Awesome giveaway!! I have seen these, and wanted one for a while now! Please sign me up! Oooh, I LOVE this!!!! How fun!!! Things I would do with a Sillouette? Catch up on my daughters scrapbook, get a little vinyl happy with signs all over the place, make some really cool cards,have lots of fun!! I love the glass etching feature....especially the name on the glass dishes...I would SO do this, that way getting my dishes back from parties would be a cinch! I want one of these SO BAD!!! I would do a million fabric transfers (and a million other things too!)!!! Coolest craft invention EVER! Oh! what a fantastic giveaway!! & then hold me back cuz from there I'd go crazy!! This looks like such fun! Would love to win! Just checked out the website. Would love to use this for glass etching or vinyl wall art. oh my word...i would label everything (and probably everyone!). labels, labels, labels...swoon! Great product!! I would love to win! I would use it for labels and making decals for shirts! OOOOOhhhh the things I could create with this one!! As a stenciler for the last 16 years, I could do so much more with this .. I would love to win this!!!! That machine is like a dream come true for crafters! I really, really want to try glass etching (I bet I could make some lovely Christmas gifts). I'd really love to win one of these!! Fingers crossed. I think it would be great for making bulletin boards and other decorative things for my Sunday School class room. Oh the Christmas gifts I could make with one of these!!! Oh, I would be making things to sew on shirts and tons of Christmas presents and birthday gifts. It would be ENDLESS. Wall decals, shirts, glasses with monograms on them...on and on and on. I so want one of these! I could do so much! I love all the vinyl on the silhouette site, I would first make vinyl label for organizing! Oh, I've wanted one of these for a while now...finger's crossed! what a great product. Would love to win one of these. I think the question is what wouldn't I use it for...but seriously, I would love to use it for scrapping, making vinyl EVERYTHING and crafting! I would use this to make vinyl letters to make art for my home. blogging about it over at my blog. I want! Oh, the projects I could do! Let's see, what would I do first. Probably something with vinyl lettering for Adorable's room. love the vinyl and cupcake holders!! Amazing little machine! Thanks for the chance to win! I checked out Silouette's site. The paper crafts are nice, especially the unique namecards and also making your own cards. Ooooh I LOVE this machine!!! I LOVE the glass etching type vinyl projects. So many possibilities. I would totally do vinyl wall decor first, then some heat transfers, then....the possibilities are endless!!! I love that quote and have already written it down to put it up!! I would use it to make banners, vinyl lettesr... everything!!! I would LOVE to have one of these! Thanks for sharing it with one of us! Love the mirror! What a great project idea!! If I had a Silhouette, I'd use the fabric transfer function first- I love to sew and have many projects that could use that something extra! Wonderful giveaway!!!! I would do vinyl lettering and card making with this. I Love all the project ideas. I would totally use this to make label-type things for storage units, so that my closets and bookshelves and craft shelves and random other areas of the house would look neat and tidy and pretty! Especially the kids toy bins - then they'd know what to put in each bin! Pillows! First, I would use it on some pillows! I would love to win the Silhouette! Please pick me!! What a super giveaway! Count me in! Great giveaway! I would love to do vinyl decals for some of my walls! I love all the things that the Silhouette can do! I would LOVE one of these! I have so many project up my sleeve. I'd love to try the heat transfer idea. I'd love to have one of these. I'd do vinyl lettering first! I'm dying to win! Pick me!! I really think I'd use this machine for just about everything! It's perfect! I'd use it for card making, parties and gifts! What a great giveaway. I would use it to create vinyl lettering--no doubt about it! And boy, would I have fun. This could make for all new creative fun! I want to use the vinyl lettering, that mirror is awesome. I also think it would be fun to etch some glass. I have two sidelights next to my front door that would be perfect candidates! I think that I would start with the heat transfers. Some fun back to school t-shirts for my girls, perhaps. This looks like SUCH a neat toy! I would use it to cut out vinyl--for my walls, and for stencils! Oh my I would love to win this!! And I would go for the vinyl first...I would love me some vinyl!! This would so make my decision between a cricut and a silhouette much easier! ohhh, I so need to win this! Great giveaway! Thanks! Yep, I shared it with my fb friends! ohhh, I want to win, I need to win! Oh I would love to win one of these. The first thing I would try would be the vinyl letters for the kids bedroom walls. Then I would have to make up some tee-shirts!!! Keeping my fingers crossed! Thanks! Oh my, I would love one of these. I am so tired of everyone else making cute things with this machine. I want one! I would use it on walls and mirrors and a biiiggg canvas! I would for sure do some vinyl letters and a monogram letter for some projects that have been waiting for me to order some vinyl. I really want to try using some of the heat transfers. So many projects I could make with that! Oh, I adore these and want one SO bad, but it isn't in the budget. I sure hope I win! I just love it all, it's amazing! But I think I would use the paper crafting and vinyl the most. Awesome giveaway...I would love this!! I've already been to the Silhouette site and I love the transfer function plus the ability to make cool vinyl signage!! I want one! Those things are so awesome! the skies the limit... i would love all the home-made, really cool gifts i could make. and to me, there's something that sets hand done gifts apart... they mean even more, feel more special! maybe it'll be my lucky day! What an awesome little machine! I hope I win! What would I use it for? It can be summed up in three words: VINYL, VINYL, VINYL. And I would share it with my crafty baby sister (ourhappydays & lemon tree creations) because she would use it a lot too! Thanks for the chance! Oh I totally want one and would use it in a million ways!! I went over to Silhouette's site. I've been dreaming of having a variety of frames and mirrors on a wall. I love how you did your mirror. I also love Vinyl Decor on walls and tiles. I find a use for this for sure! The biggest perk on this site is the Tutorial section! How awesome is that! I've seen these from almost everyone! I want one!!! I don't think there is an end to what I would do! I would love to use one to create tree ornaments for christmas... and personalize everything!!!! i want to use it to make decals for my furniture! Oh, how I have been longing for one of these for SOOO long. I could do so much. For starters, save me time manually cutting out my letters for scrapbooking, birthday party decorations, lettering for my new laundry room... oh please oh please!! DYing for this! how awesome! I went to the site and I would mostly use it for fabric transfers and vinyl! I can't wait to make a stencil so I can add an awesome design to my wall. I tweeted. I found you and then "followed" you. I then tweeted about your giveaway on the blog. (my userid is dlk3265). I hope I did it right! I would definitely use it for vinyl and stencils for our furniture redos. Ooouuhh! pick me! I would be a decal making fool! oh, i'd love to win a silhouette!!! i would make loads of vinyl for walls and decals and such!! I would love to win this, I would make some vinyl transfers for my walls. I would LOVE one of these... DROOL! I would love to do a verse in vinyl above my breakfast nook, some lovely vines to grace my plain kitchen cupboards, and few thousand birthday cards... WITH STYLE! TEMP TATOOS!!!! how cool is that? My son has been wanting specific ones for ages, bionicles, but no such beasties exsist... I could really have some fun with that! I have been wanting one of these in the worst way for some time now! the first thing that I would make would be a family themed subway art mirror. Thanks so much! WOW! An awesome giveaway. I purchased a Cricut and am disappointed with it. The cartridges are so expensive. With the Silhouette you can download to your computer all their images, I believe as little as 99 cents each. Which gives you endless possibilities to create. There would be no stopping on what you could do with this fabulous machine. Please enter me in your fabulous giveaway. I would use it for the "Sketch Designs", "Rhinestone Templates", and "Transfer Designs". Everything my Cricut cannot do! I would definately be creating all sorts of vinyl lettering clings!! Please, please, please pick me!!!! I have so many ideas of what I would do with this machine. I promise I would put it to good use and not let it collect dust in a closet. Oh yes.... please please pick me! Oh yes, I've facebooked it all over! I'd totally love to win this! I have some vinyl projects in mind, plus I'd like to try the heat transfer on some shirts for my kids. visited silhouette...love ABSOLUTELY LOVE their vinyl cut outs. REALLY. I'd cover my house in it all.